Never Play Cards With a Man Called Doc: Happy 100K Erin! My first true love (at least in the auto world) is Erin, my 2003 BMW. Long time readers know that I named her for Erin Gray (circa Buck Rogers) because she's gray and beautiful. I used to have a terrible case of car ADD. I never owned a car more than two years. Erin and I have been together now since the beginning. I remember the day I took delivery. A gorgeous sales rep named Ilse drove her up to me at the dealership in Wuerzburg, Germany and all I could think was, "That's MY car. Get out." Putting on the cruise control with the top down at 134 MPH on the autobahn. Scratches all over the back seat from constantly putting in and taking out the kids car seats. The long wait while she sailed from Germany to Washington State after we moved stateside. Sliding down the driveway after a horrendous ice storm. Sliding out of the garage into a tow truck, for which our insurance premiums were increased because it was an "auto accident" (even though the car was off because the battery died while I was in Iraq and even though the tow truck driver was the one who told The Wife to push it out). Hopping her on to the UHaul trailer so she could make the drive to California. Calming her down after parking her new older but hotter sister right next to her. My oldest son has asked me to give Erin to him when he goes off to college. That's 6 years away. I'll probably still have her. I just don't know if we'll be willing to part. Indiana used to sell antique plates. To get one the car had to be over 25 years old. Pass that age on the streets all the time. But oil can be changed. So can the happiness of his college experience. You have all that in your grasp. But, I'm sure you were already well aware of all that! Yeah, keep him guessing. Oh, and I'm sure that the car is OK too! Wow...BMWs have been known to last for many moons. There is something to be said for your first car being one that you purchased yourself, though. Perhaps I am just crotchety. Great post! 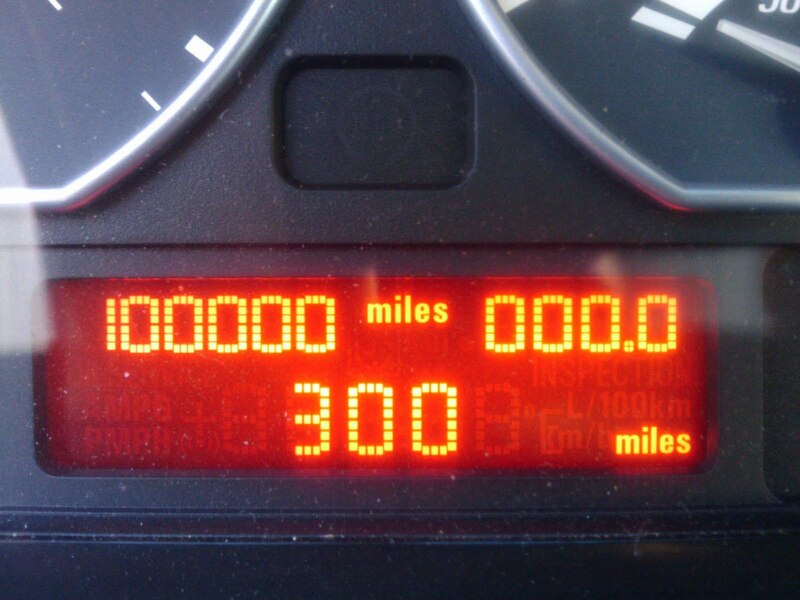 Pretty cool, but I should tell you, one of our cars just passed 100,000 miles as well. It has no nickname. I just call it, "The Minivan". It's 2004 Town & Country. It's navy blue and has Minnesota Twins clingy things in the back windows. It's spacious and smells like well aged McDonald's Happy Meals stuck under the seats and long forgotten. I took pictures of the odometer too, but alas, no pictures in the comments. Just know, you win the cool car contest. The fact that mine is a minivan immediately disqualifies me from winning. I have never named a car. My younger brother has taken possession of every car I have driven after I was done with it. 230k miles on Nissan Pathfinder that brother still drives. Prius has a long way to go. Erin Gray in jumpsuit was amazing. BTW, Miss Grey's name on Buck Rodgers was WILMA. I think you are cheating.